is for hotoke, or the Japanese word for Buddha. I grew up around buddhas. My family’s house was filled with them. Old iron and wooden faces conveyed a sense of peace and clarity that I think calmed me as a child. There was one buddha in particular that I always felt a certain affinity to, and would often rub his hands or head when I walked by him in the living room. Japan, naturally, is full of buddhas as well. Arhats, bodhisattvas, buddhas, and other deities are as common as American flags in the U.S. Not just relegated to the temples and sects to which they belong, buddhas can also be found hidden in the mountains, on streets, and in homes, offering protection and wisdom to those that notice. What has become so familiar will be hard to leave, next year. The smell of incense, monks trolling down the streets chanting, and the distant clang of bells are part of the heartbeat of Kyoto, and it is strange to think of living without it. Pictured below are some of the buddhas of Japan, most in my neighborhood. The buddhas with pinwheels protect the souls of unborn children that have died, while the final picture, one of my personal favorites, shows an arhat laughing behind another similar statue that already lost its head. Is that the Kanji for Buddha in your post title? Wow. I don’t know if I can express how much I love that. It is! I’m trying to put a kanji in each banner to represent the word of the day. 🙂 Glad you liked it! Hi Alex! I was in Japan for two week on a business trip in 2009, and I got to spend a day in Kyoto visiting some of the temples and shrines. One of the ancient temples had rows of Buddhas. I wish I could remember the name. I think you may be remembering Sanjusangendo, the Hall of a Thousand Kannon. It’s very famous, and very beautiful. Unreal to think of how many years it took for them all to be carved…. I love the last picture! And the one with the writing. I have never lived in a place where the majority religion was different from my own. It must be a fascinating experience! PS: The show you asked about on my blog is called Vikings. The translation of the saga I read is linked at the beginning of the post. The atmosphere you’re creating with yout posts is so very enchanting. 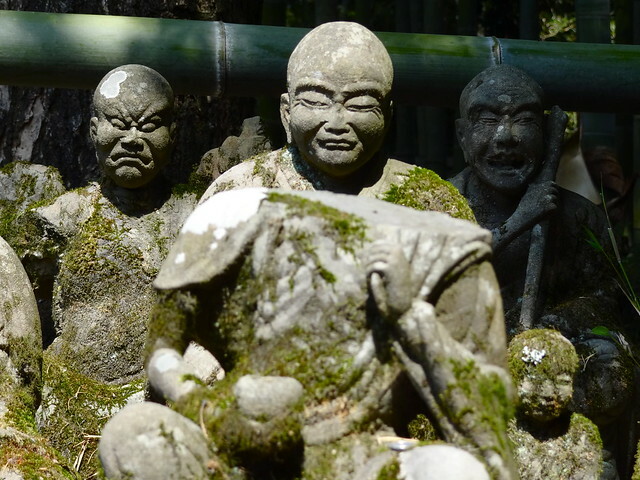 I loved coming across the old buddhas in the mountains of Japan…the ones that look as if they had been there forever. Their edges were soften by the weather and they were covered by moss, but you know someone was still visiting because there would be fresh offerings. Have you seen the giant one in Nara? It was quite something to behold! Yes! The giant one in Nara is the first picture. 🙂 I want to go again before we leave. It’s really an amazing sight. Your pictures are awesome; they convey so much is something so still. The pinwheels are so sad. Japan is somewhere I would love to visit one day. I really recommend it if you ever get a chance. There are little treasures everywhere. 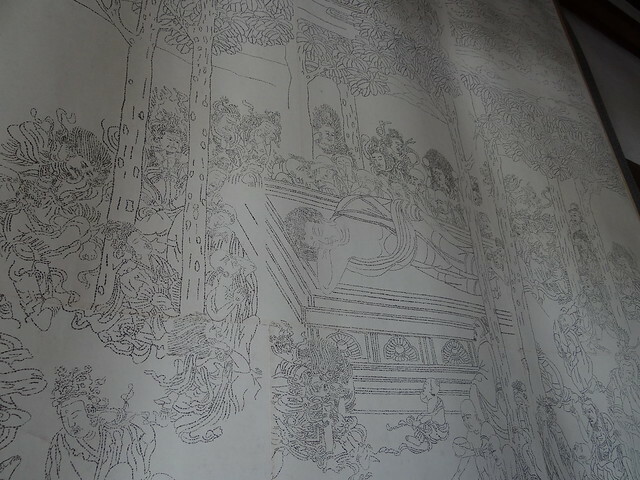 It’s hard to see, but that tapestry I showed the photo of is comprised entirely of kanji characters, and is a sutra written out over and over, building the scene of the Buddha’s death. I love traditions and beliefs that last through the ages and to stumble upon a buddha while hiking would be really cool. I agree. There’s a long trail up the mountain behind our house, and every 50 meters or so there is another Buddha on the path that helps with different afflictions, like blood pressure, tobacco addiction, etc. It’s really interesting. Thanks, Sheena. When I first learned about them I almost cried… so many of them with little bibs. Hard not to be moved when there are so many up on the mountainside. I love the pinwheels with the buddahs! I’m sorry you’re leaving Honshu but know your blogging and wonderful pictures will hold those memories well! It’s always fun visiting your blog! Thanks so much, Sue. The buddhas with pinwheels are very beautiful, but their meaning is a bit sad. They protect the souls of unborn children, who can not be buried in any way. For some strange reason I left my little buddha statue behind in my last garden. No idea why. It gave my neighbours plenty to gossip about, anyway! Sometimes we leave stuff behind… the place they’re a part of need the character. 🙂 I always like finding little gems in a new place I move into. My family once found a fully-assembled miniature sailing boat under our bathtub…. weirdest place ever, since it was less than a crawl space. But there it was. Beautiful, wooden, Spanish ship! So interesting, Alex. Reminds me of why I loved visiting Japan. This is a treat! Oh, the pinwheels! So powerful. I agree. The bibs, though, that’s what made me nearly cry. My mom spent a few years in Japan as a child, so our house was filled with Buddhas. They’ll always remind me of home. Same. ☺ that’s why they make me so happy. A lovely post, Alex. 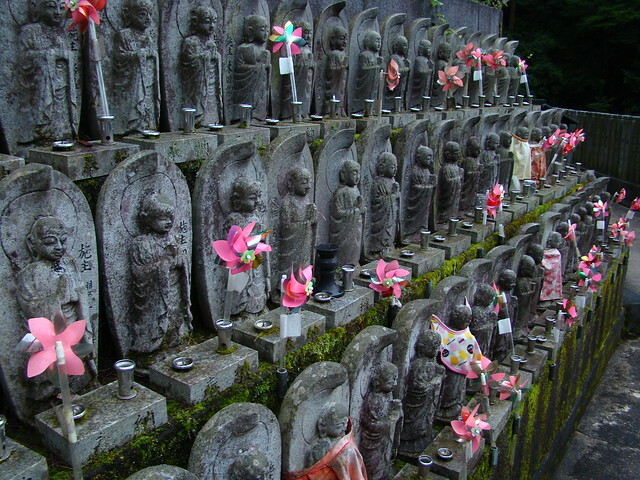 The buddhas with the pinwheels are such a sad and yet beautiful sight. Seems a nice way to mark something so tragic but special. Yes. I’d heard about them before, but when I saw this wall of them on the mountain overt nearly cried. It was very touching. I’ve not been to Japan but have seen many lovely, and varied, Buddhas in China and SE Asia. I love visiting temples and the smell of incense. There is a certain similarity between temples and Buddhas in Korea and Japan. They have similar austere, whereas temples in Taiwan and China are more colorful and complex. Thank you. I agree. For me, they symbolize compassion, something I try to use everyday. Very cool. While hubby and I were in Toledo, we went to the art museum and they had a cool Buddha statue. Usually the Buddhas in museums are pretty impressive…. No damage. I bet it was awesome! Thanks for stopping by, Patricia! I know when we visited Thailand, there were Buddhas all over. Sounds like much the same in Japan. Great pictures, great post! Thank you David! And they really are everywhere. Everywhere! I love Buddhas! I have one my ex sold to me, and another small one I bought at some Oriental-themed store at a now-defunct mall. One day I want to get a much larger one for the living room or a garden. I also have a cross-stitch of Buddha sitting under a Bonsai tree, with Chinese characters on the right and left sides. One of the cross-stitch projects in my queue is another design of Buddha, I believe with cherry blossoms. Fascinating legend as well. Far out there stuff, but very interesting. Thanks so much, Joe. There are a lot of stories behind things here. Some are stranger than fiction! Sometimes I wish I had not grown up in a land without culture. They really are! It’s wonderful having everywhere. I never realized Buddhas were so prevalent in Japan. Though other future travels have taken precedence on my list, I’d still like to eventually make it to Japan, as well. I think you’d love it. The mix of old and new is really quite seamless. A Japanese student my husband and I befriended and let live with us for awhile lives in Tokyo. I never realized how different our culture is from theirs. Everything in the home, for instance, should have a function. I loved the simplicity she taught us. That must have been quite the experience! I think I’d enjoy opening my home to Japanese exchange students… when I finally have a home of my own, haha! The pinwheels are sad but beautiful. I can so see buddhas as guardians of children. I wish I’d grown up around them, too – I’m sure I would have found them comforting! So many pinwheels. That’s sad. I’ve always liked the feelings of peace associated with Buddha. Serenity in the midst of so many storms. Your photos are lovely. I like the interesting expressions in the last one. That’s my favorite one, too. But if you click the photo, you can go to the album where all of his friends are. All of the arhats in this temple were really unique. Every time I visit a temple, I am always drawn into calm and peacefulness of the place, specifically because of the smell of the incense. I haven’t been to Japan but my favorite Buddha so far is the big sitting Buddha in an island in Hong Kong. I liked the way you are writing the titles of your posts..It’s so unique and so relevant to your theme. Wonderful! Thank you! I had a lot of fun creating the banners. 🙂 The hard part was sifting through thousands of photos for specific ones! Great posts for A-to-Z. Keep up the great work! It would be nice if there were more people like Buddha in the world. I think there are a lot of really wonderful people in the world, it’s just circumstance that makes them hard to find. Do you happen to know why they put clothes on some of the Buddha statues? When we visited the shrine in Asakusa, there were a couple of the statues that were either wearing clothes or wrapped in red fabric. I never saw anything that told what that signified. I didn’t know ahead of time, but I did some research. It depends what sort of statue the bibs are on, but basically, if it’s like the “jizo” statues above, the bib is supposed to help guide the buddha to find the child that was lost. Many of the bibs are “stained” literally or figuratively, with the smell of the infant that died, and it helps the buddha find them. If it’s not a ‘jizo’ but another type, it’s a garment meant to symbolize clothing, as the buddha is a traveller, and needs clothing to survive the elements. Yay, learning! I went out and picked strawberries, then visited the tomb of an emperor. Love how you are showing pictures and the culture of Japan.